Like about 100 million people across the country, I spent my Sunday evening watching Super Bowl XLIV between the Indianapolis Colts and the New Orleans Saints. I didn’t have a particular rooting interest in either of the teams although I did enjoy the feel good fairy tale ending for the city of New Orleans. It was mainly about the food and the commercials for me but that doesn’t mean that I wasn’t interested in the outcome. Some Wall Street analysts like to try to forecast the economy and the stock market in the same way that Punxsutawney Phil likes to predict the weather – trying to derive something meaningful out of a random event even though there’s no rational connection between the two. A groundhog in Pennsylvania doesn’t have the ability to control global weather patterns but that doesn’t seem to prevent some folks from trying to harness their predictive power. The Super Bowl is no different. Some prognosticators believe that the result of the game helps determine the direction of the market for the coming year. Here’s a look at a few of the theories tied to the NFL’s biggest game (thanks to Capital IQ for several of the stats). Theory: If the Super Bowl winner comes from the old NFL, we’ll be in for an up year. If the Super Bowl winner comes from the old AFL, look for a down year. Evidence: Historically, this indicator has been surprisingly accurate being right on the money about 80% of the time. The indicator has been slightly less than reliable in recent years. Outlook: Good. New Orleans is an original NFL team and picked up the win this year so, according to this at least, things could be looking up. Theory: Stock market returns are significantly higher when the Super Bowl winner comes from the NFC versus the AFC. Evidence: In years where the Super Bowl winner comes from the NFC, the S&P 500 is up an average of 15% per year. In years where the Super Bowl winner comes from the AFC, the S&P 500 is up an average of just 7% per year. Outlook: Good. This one is pretty similar to the first theory. New Orleans comes from the NFC. Theory: Years in which the Super Bowl produces a first time champion tend to also produce solid stock market returns. Evidence: The S&P 500 has produced an average annual return of about 9% in years where the Super Bowl winner is a first timer. This, perhaps not so coincidentally, is also roughly the long-term average annual return for stocks. Outlook: Good. 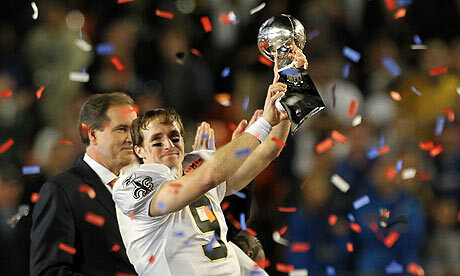 New Orleans won their first Super Bowl this past weekend. Theory: The stock market will perform better if there is a higher combined total score. Evidence: In years where the combined number of points scored by both teams tops 45, the market has returned an average of 17% per year. If it’s below that number, stocks have averaged about 7% per year. Outlook: Good. The final score for this year’s game was 31-17. Look at that! We’re four for four! Guess we’re in for a good year, right? It could be except for one little thing. The Super Bowl has nothing to do with the stock market. Keep in mind that everything presented here is just for fun. The result of a football game obviously has no bearing whatsoever on what the stock market is going to do over the next 12 months. If you’re planning on managing your money according to anything you’ve read here, you might want to rethink your strategy. Any investment you make needs to be based on the fundamentals of what you’re investing in and nothing more but it’s OK to have a little fun with it too. Just don’t put too much trust in a game or a groundhog!